Creating nearly anything of use, value or size is usually made up of many parts. Some parts may be bigger than others, but they all contribute. Building a business made up of people aligned to a purposeful future is definitely something consisting of many parts. Not only the people, but the small actions, rituals, and stuff we do on a daily/weekly/monthly basis. That is definitely the case in the business I lead, The Physio Co (TPC). Our high priority team culture at The Physio Co consists of many smaller parts, like daily huddle meetings & calls that happen every day; our 'welcome day' sessions that occur regularly as we celebrate and induct our newest team members; and referring to our core values in many conversations day-to-day. But there are some bigger parts to the puzzle that also contribute to the workplace culture we're trying to develop at TPC. Let me unpack these initiatives to give you a sense of how they contribute to the TPC culture. Maybe there are similar things you can do - or are already doing - in your business or organisation? TPC Swarm, formerly known as the TPC Team Conference, was first held in 2009 as a half-day professional development session for 15-odd TPCers in a rented classroom across the road from our first TPC office in St Kilda. TPC Swarm is a once-per-year, all-team day of learning, connecting and celebrating. It has evolved a lot over the years. We've held it at a variety of venues, from Honey Bar in South Melbourne through to Quay West at Southbank in 2016 & 2017. 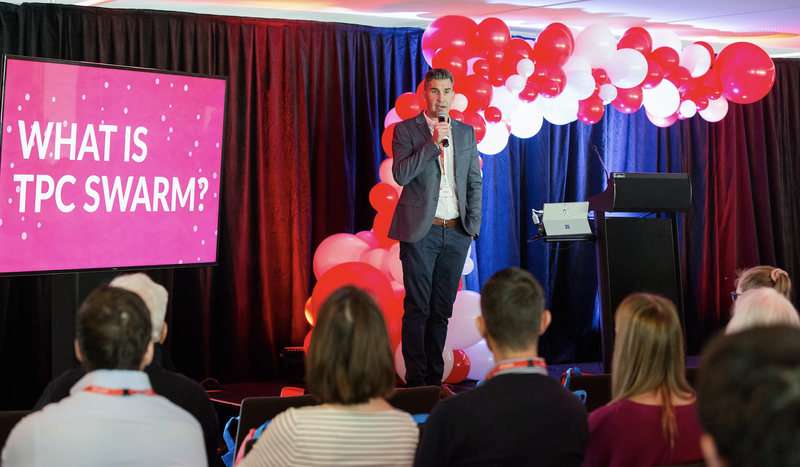 This year TPC Swarm was held at one of Melbourne’s great sports stadiums: AAMI Park, and it was our biggest event yet, with 100+ people attending. Also, for the first time we threw open the doors to non-TPC team members, which might seem a bit counter-intuitive for what essentially is an in-house event, but at TPC, we're all about connecting, learning and growing together, so why not welcome others wanting to join in the fun? We will do the same again next year for TPC Swarm 2019, which is likely to include learning sessions for both clinical and non-clinical topics that will contribute to us helping more seniors stay mobile, safe and happy. The announcement of our MVP of the Year Award. Our MVP (or Most Valuable Person) of the year award. MVP of the Year is our biggest and most exciting award! At TPC Swarm 2018, TPCer Michael Quinn was announced the winner of 2018 MVP of the Year. Nominated by Jess Donsen for living the TPC core value of Find a Better Way, Mike accepted the award along with 3 runners up who won awards for living our core values. The third of three big pieces of the TPC culture rituals is the release of our annual TPC Culture Book. This is our version of a yearbook. It's a glossy 70 page book, available online and offline, that is shared firstly with our team, and then the world more broadly. * The TPC Culture Book 2018 is made up of photos, quotes, award winners, parties & TPC award winners. Flicking through the newest edition, spotting your workmates, reading about the newest TPC babies, weddings and engagements and remembering what’s happened over the past year has become a bit of a tradition at The Physio Co. It takes a lot of work to create such a publication, but documenting our history on an annual basis is a critical part of the 'Culture Is Everything' system that we’re committed to, so we're more than happy to make it a priority for our company. The sum total of the various things big and small that go into building a workplace culture can sometimes be hard to calculate or quantify. All we know is that, as a business, not only do we continue to grow and evolve but have also received external recognition for the culture we have managed to build over the journey. Re the former, we have delivered close to 1.5 million unique consultations since 2009, and this year have added an extra 46 team members to keep up with demand. In terms of industry recognition, we have just been announced as a Laureate Award winner by the Great Place to Work Institute for being ranked as one of Australia’s 50 Best Places to Work for 10 consecutive years. When you look at your company, what are the small and big parts of your business that are foundations of who you are and what you do? We all have them. The goal is to identify, embrace and celebrate them - bring them to life so they become an inextricable part of your workplace culture.